Share the post "Win a Getaway at LEGOLAND Discovery Center Chicago"
Prize: One winner will receive a family 4-pack of tickets for LEGOLAND Discovery Center. Spring Break is in full swing, and families across the Midwest are looking to escape the winter doldrums with fun and easily-accessible weekend trips. LEGOLAND Discovery Center, located in Schaumburg, Ill., is a must-see attraction for any family planning a getaway to the Chicagoland area. With more than 3-million LEGO® bricks, creative building challenges and nine interactive activities, including the Master Model Builder’s Workshop, Jungle Expedition, Dragon Ride and LEGO® City Construction Site Play Zone, the Center is a perfect playground for kids of all ages. · Be inspired the creativity, shared play and learning opportunities throughout the center. LDC also offers guests a list of preferred hotels to help ensure a LEGOtastic experience. Located at the Streets of Woodfield, 601 N. Martingale Rd. 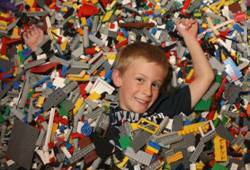 in Schaumburg, LEGOLAND Discovery Center is 30 minutes from downtown Chicago by car. Adult Admission is $19. Child Admission is $15. Special annual pass and ticket discounts are available at http://www.legolanddiscoverycenter.com. Last guest admission is two hours before closing. Extended hours are available on school vacation days and national holidays. 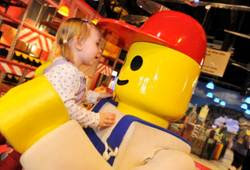 Visit http://www.legolanddiscoverycenter.com for updated daily opening times. The average guest spends two and a half hours at the Center. • LEGO Racers: Build & Test: There are thousands of bricks waiting for you in the Build & Test area. Time your race car on our speed test track and see if your LEGO tower can survive the shaking earthquake tables. • Master Model Builder’s Workshop: Do you want to learn some top LEGO secrets? Meet the person who knows more than anyone about all things LEGO and build your very own LEGO model with the help of our Master Model Builder. o Bob the Builder 4D – join Bob, Wendy and Spud as they build their very own rollercoaster. o LEGO City: A Clutch Powers 4D Adventure – engage with our hero, Clutch Powers, and his gang as they take on a special mission. • LEGO City Construction Site Play Zone: Imagination can run wild and visitors can let off some steam at the LEGO City Construction Site Play Zone. Big, bright and welcoming, this climbing area is the perfect location for a little supervised chaos. LEGO City never stops building and its visitors have been hired as part of the construction team. The construction site is full of oversized LEGO bricks that have just been delivered and are ready for building. Guest can use the crawler crane, the wrecking ball and other equipment to expand the imagination and to create something new. • Dragon Ride: Climb aboard the friendly dragon for a journey into the depths of our medieval castle. Be careful of the giant red dragon though, he has a habit of appearing when you least expect him! • LEGO Factory Tour: Experience the bright colors, animated workers and sounds of our special LEGO brick factory – press the buttons and see what happens! • MINILAND: Discover a miniature Chicago featuring landmarks made from more than one million LEGO® bricks. • Technicycle Ride: Round and round you go on the Technicycle as you pedal your way upwards to the skies. • DUPLO® Village: A great place for the younger members of the family to learn how to build with LEGO bricks. The village contains hundreds of DUPLO bricks for little children with big imaginations. • Jungle Expedition: What creatures will you encounter deep in the heart of the jungle? What treasure will you discover? Find out as you follow the trail into the LEGO jungle. • Celebration Rooms: No matter what age you are, guests can make a memory by hosting a birthday or other special event in one of the LEGOLAND Discovery Center’s celebration rooms. With options for a personal guided tour, hot and cold party foods, soft drinks, cake, goodie bags and more. Celebration packages can be customized to create an experience like no other. • The LEGO Café: Wind down in the LEGOLAND Discovery Center Café with a relaxing cup of tea or coffee. Choose snacks or a full meal for the whole family from a great selection of hot and cold food. If the young ones still have energy left, don’t worry, there are plenty of LEGO bricks in the café area to keep even the most ardent of LEGO brick builders happy while adults relax with one of our complimentary newspapers. • The LEGO Shop: Visitors to the LEGOLAND Discovery Center can leave with some LEGO magic and creativity by taking home big boxes of bricks or special LEGO kits. All the very latest LEGO products are available, as well as some exclusive LEGO items! Disclosure: My family received tickets that were provided free of charge by LDC.